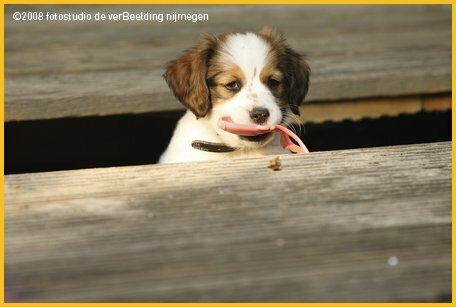 Ga je ook kijken naar onze honden op animal planet? Although it’s not yet listed on the Discovery Channel web site, other TV sites have posted the air date for the episode as November 27 at 8:00 p.m. 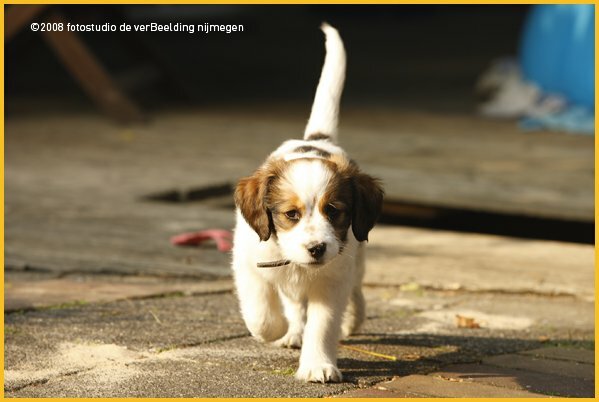 They will feature the Kooikerhondje (including Hamlet and Elsie, as well as Yorick’s parents), Leonberger, Dandie Dinmont Terrier, Tibetan Mastiff and the Affenpinscher. Thanks to Selda from cologne, who owns a kooiker from Yorick’s breeder Roel Steenhuis, for alerting me to the date! Folks all over the world are gong to tune in for Hamlet’s 15 seconds of fame! 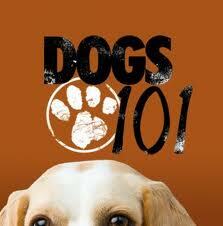 Kooikershondjes from Den Altforsterhof on Animal Planet, watch our dogs, for informations contact us! Although it’s not yet listed on the Discovery Channel web site, other TV sites have posted the air date for the episode as November 27th at 8:00 p.m. 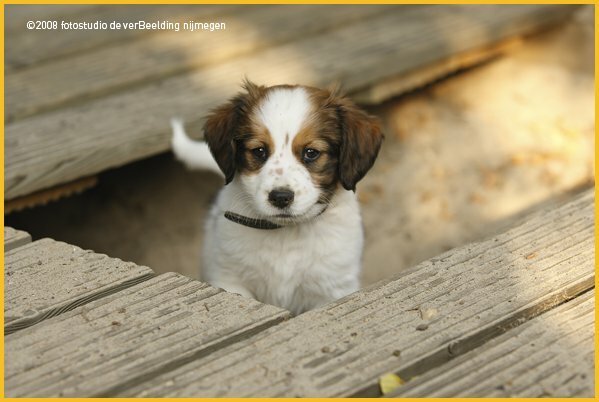 They will feature the Kooikerhondje (including Hamlet and Elsie, as well as Yorick’s parents), Leonberger, Dandie Dinmont Terrier, Tibetan Mastiff and the Affenpinscher. Thanks to Selda from Cologne, who owns a kooiker from Yorick’s breeder Roel Steenhuis, for alerting me to the date! Folks all over the world are going to tune in for Hamlet’s 15 seconds of fame! ALTFORSTERHOF DOGS, THE BASIC FOR BREEDING IN THE U.S. The dutch texts are being translated. Our appologize for this. We hope to have them all available in english for you soon!Op dit moment word er nog hard gewerkt aan de engelse vertalingen, excuses voor het ongemak! This renewed website is a answer upon misunderstandings of the backyard breeders. 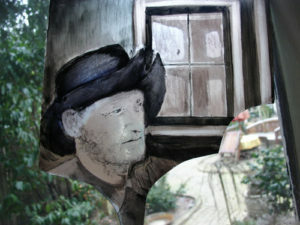 Skip can be found in flyers of welkoop and the boerenbond. Our dogs are models, regulary there is a photo shoot on our farm. The camaracrew, director, soundman and productionleader visited us this summer. After lots of pushing of animal planet, we finaly agreed upon the shoots. The unique situation of 10 adult dogs at our house, not living in a kennel, but free on the land, makes it a unique happening for humans and pets living together. The america crew of animal planet together with our dogs. The first broadcast will be in december on american television, we will keep you informed throug this site. 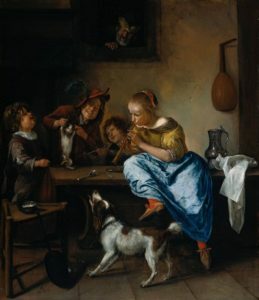 Old Masters paint beatifull paintings with spaniellike dogs. 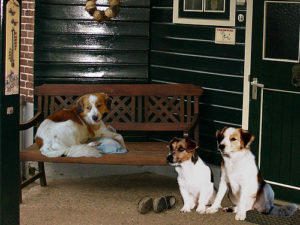 The kooiker a spaniel, is often found in housely scenes. I name the most famous one of Jan Steen, the dance class.